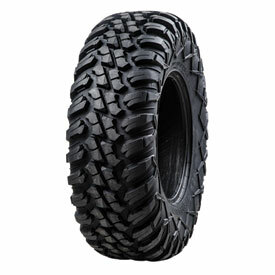 The Tusk Kevlar Terrabite tire is the ultimate all terrain tire for your UTV or ATV. The bead to bead Kevlar belting gives this race tested tire unparalleled protection from sidewall tears while also increasing durability in the tread area. The truck style tread pattern provides excellent multi-surface performance and high mileage while meeting DOT standards. Aggressive shoulder and sidewall tread add protection and extra bite in dirt, sand, and rocks. The combination of the proven Terrabite and bead to bead Kevlar belting make this tire a complete package for all terrain performance and durability. Bead to bead Kevlar plies for ultimate durability. High load ratings for today’s larger machines. So far they have been great. Only been on one ride with them, but no issues. Did very well on rocks and in the mud. Very satisfied! Glad I made the purchase! We bought a set of 32×10×14 Kevlar Tertabites. There are just over 400 miles on them now. We've been running them hard in the Nevada and Arizona Desert. We have destroyed every tire that's been on our machine in the caliche gardens of these deserts. We can honestly say that the RM boys have hit the ball out of the park on this tire design. They ride great, take the corners even better and hooks up perfectly. They show no signs of wear from the effects of the tire destroying caliche rocks. This tire is high quality and priced right. We can't say enough good about this set of rubber. Kudos to the RM boys for this tire. How much does the 32x10x14 weigh? How tall are the 30/10r15 Kevlar terrabites and the 32/10r15 in inches ? BEST ANSWER: I measured the tires on the ground and it was not mounted to a wheel. The 30" measured at 29" in height. The 32" measured at 31 1/2". How many plies of Kevlar is used? BEST ANSWER: It is an 8 ply tire. specs state the tire is 8 ply RATED, actual number of plies is not disclosed. Nor does it say how many plies are actually kevlar. Will there be a 28x10-14 size option? BEST ANSWER: Yes we will in the near future. We are waiting to receive them into stock. Would sure like to have an ETA on this size. I REALLY need new tires and this is my #1 selection, but I can’t wait forever. 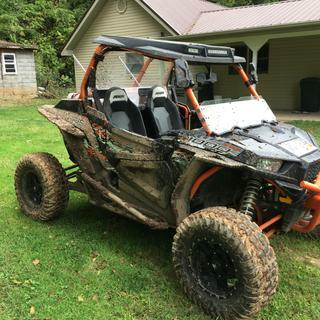 Can Rocky Mountain ATV/MC please measure the height and weight of the tires so we don’t have to rely upon customers to do the work for RM ATV/MC? The answers provided for the same question vary by each customer and are “solely the views and opinions expressed by those customers”. Customer feedback is very helpful when deciding which products to buy, but shouldn’t be the only source for important details such as size and weight. Thank you! Tusk Terrabite Radial Tire 30x10-14 Medium/Hard Terrain 35.5 28" 10" 3/4"
Tusk Terrabite Radial Tire 30x10-15 Medium/Hard Terrain 35.5 28" 10" 3/4"
Tusk Warthog Radial Tire 30x10-14 Soft/Medium Terrain 35.5 28" 10" 3/4"
Tusk Warthog Radial Tire 30x10-15 Soft/Medium Terrain 37.3 28" 10" 3/4"
Tusk Terrabite Radial Tire 32x10-14 Medium/Hard Terrain 40.2 31.5" 10" 5/8"
Tusk Terrabite Radial Tire 32x10-15 Medium/Hard Terrain 39.5 31.5" 10" 5/8"
As we ride faster with these larger tires ,balance becomes more of an issue. Can you possibly tell me the average weight needed to get these in balance. My guess that the Height is not mounted correct? BEST ANSWER: I show the weight at 40.4 pounds. How much does a 30x10x14 weigh? Want to go from my 30” stock tires on my Polaris rock crawler to the 32” Tusk Kevlar Terrabite. I ride Colorado trails, Moab, Arizona Desert mountain trails, I’m in in my mid 60’s now with 6 grandkids so absolutely no speed. You have to look twice to see if I’m moving. My stock 30” measure under 28” with 8 pounds of pressure so I would like to gain a little height by going to a 32”. I’ve been told no problem, but watch the tire weight when going taller. Would appreciate your thoughts?? BEST ANSWER: We suggest not going bigger than 2 tire sizes above stock. If you decide to go with larger and/or wider tires we suggest adding wheel spacers, lift kit and or even a heavy duty clutch kit. The larger and/or wider tires put more stress on suspension, steering, engine and clutch systems. The Tusk Kevlar Terrabite tires are one of our most popular selling tires. We run the Tusk Kevlar Terrabites on all our UTVs. I highly suggest buying them. To see if this part will fit your machine please enter the make, model, and year into our "Choose a vehicle" drop down boxes found above the product image. If your machine is not listed, we may not carry the right item for your application. If you have a 2019 year model but don't see your machine as an option, please contact a tech via Live Chat or call us at 1-800-336-5437 for assistance. My Polaris special edition rock crawler came with 30 x 10 X 14. Bead lock rims, front rims are narrower than back. All 4 same size tires. My question, will I be ok going to your tusk Kevlar terrabites in a 32 x 10 x 14 ??????? Can I get your year, make and model or can you send your VIN to tech@rockymountainatv.com with that question? I would love to verify your machine information so I can quote you correctly. If your machine came with 30" tires stock then the 32" tires should fit. We can not verify that your machine will be okay going with a larger tire since it is putting more stress on engine components, clutch system, suspension and steering systems. What does the 30x10-15 weigh? Do you have the Kevlar in 26 11 12 or 26-9-12? BEST ANSWER: Yes, they are great. Rode smooth and have great traction. No, I have them in 30-10-14's. Very smooth riding tire! No. I have that tire in 30-10-15. Need to call there help desk. Can the Kevlar tusk terabite be mounted on standard rims or do you have to have Bead-locks? BEST ANSWER: We would rate these on the top tear of longevity compared to all other tires. These tires will work great in those conditions compared to a lot of the stock tires on the machines. I would look into the reviews from customers as well to see peoples first hand views on the product! Rear tires will show wear just the nature of the beast with posi lower psi helps I set mine to 10 in rear 12 in front. Ride nice set there. But weight rating is reduced. Why should I buy this over a Kanati Mongrel which is about the same price? BEST ANSWER: The Tusk Kevlar will be much more durable than the Mongrel. I'd like to see a real comparison between nylon and kevlar ply tires. Weight, puncture and sidewall durability, etc. Beware that the tusk is way under sized compared to the mongrel and other brands. Won't waste my money again on subpar tusk tires. How much more would the Kevlar edition weigh over the standard Terrabite tire in a 32x10-14? BEST ANSWER: To me they seem to weight less than the standard steel belted tire. They also ride so much better. I have owned both styles of the Terrabite tire. BEST ANSWER: The Terrabite is 35.9 lbs and the Kevlar is 34.9 lbs. How is the ride or the kevlar vs the original terrabite. So my question is do they have a stiffer sidewall? BEST ANSWER: The Kevlar Terrabites have a stiffer sidewall with Bead to bead Kevlar plies for ultimate durability. Product note states: The bead to bead Kevlar belting gives this race tested tire unparalleled protection from sidewall tears while also increasing durability in the tread area. BEST ANSWER: We will only mount the tires in the tire and wheel packages. Unfortunately, we will not mount the spare. I apologize for the inconvenience. Hi I’m interested in your tusk tyres but just want to no what is the weight of one tyre ? It’s for my x3 so just seeing what the weight of the tyre would be . Thank you and if it is the same as the stock one I will give them a try . BEST ANSWER: What size are you wanting the weight on? BEST ANSWER: I show the GBC Kanati Mongrel are 27.6 pounds, Maxxis Bighorn 30.6 pounds, Maxxis Rampage 32 pounds, Maxxis Bighorn 2.0 19.2 pounds and Sedona Rock-A-Billy 36.3 pounds. What is true size or how tall is 30x10x14 mounted on 7inch wheel? BEST ANSWER: 28.75" is how tall the 30" tire is mounted. I just measured them with 18 psi on a concrete surface with a level on the top of the tire. I measure 29 inches mounted on STI HD beadlocks. Are the 32 10-14 true to size 32” tall ? BEST ANSWER: I measured the 32" tire at 31 1/2". The tire was not mounted and sitting on the ground. How much does Tusk Kevlar Terabite 32x10x15 weigh?